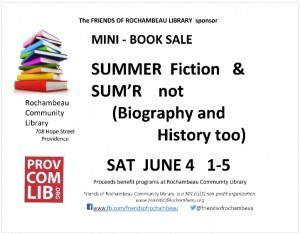 Wendy Nilsson, Superintendent of the Providence Department of Parks, will be the featured speaker at the Friends of Rochambeau Library Annual Meeting. She will discuss her vision of Providence Parks, provide an overview of Providence Parks and highlight how community engagement and programming is improving our city. She will also talk about specific projects at Prospect Park, Blackstone Woods, Summit Ave., Gladys Potter, the Morris Ave. “Totlot”, India Point and Roger Williams. Come join us for an update about your favorite park and learn about our extensive and diverse park system. For the past decade, Wendy Nilsson’s passion has been the development of Providence’s green spaces into a network of vibrant and unique parks. In 2006, Nilsson founded the Friends of Brown Street Park, which has been cited as a national example of sustainable and innovative urban park revitalization. Six years later she established and became founding Director of the Partnership for Providence Parks, a non-profit that brings community, business and city resources together to improve Providence’s park system. As the Superintendent of the Providence Department of Parks, she sees her mission as redefining the ways parks are used, not only through the amenities offered and creative use of resources, but also through the way that residents and community partners are brought together to create parks’ programming and activities that engage and inspire. 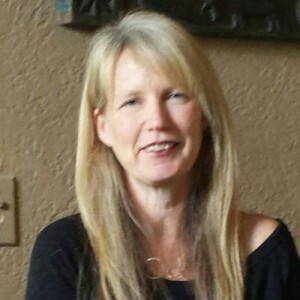 Nilsson has a Masters Degree in Administration and Policy from Boston University. 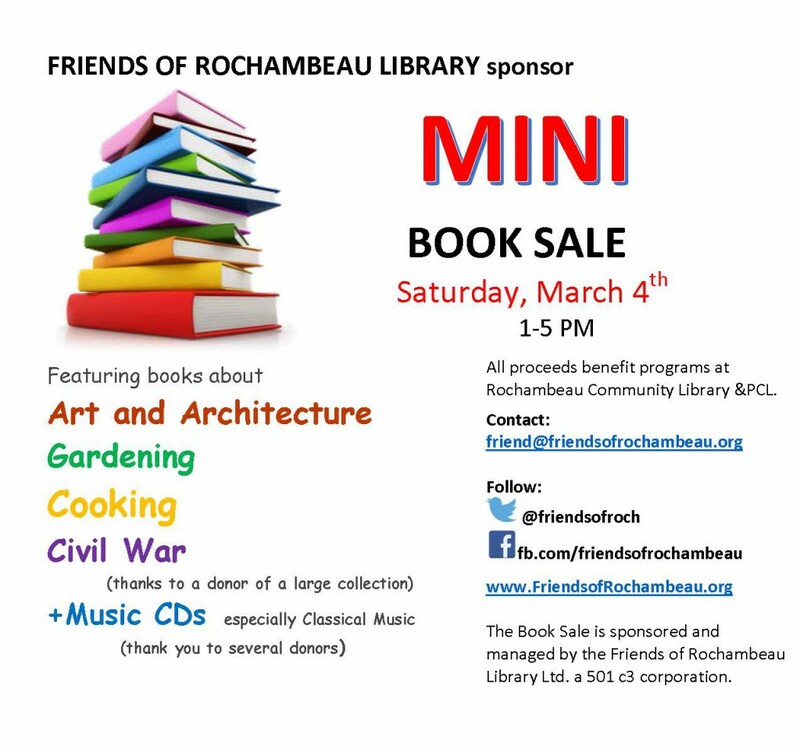 This Saturday, March 4th, come to Rochambeau’s Community Room on the lower level for DEALS on BEAUTIFUL BOOKS for your den, study, living room or library shelves coffee tables and nooks! See poster, below, for more information! another great poster from the FOR Media team – why not join the Friends today? Enlighten Yourself: History Programs @ ROC this Spring! John McNiff, National Parks Service Ranger from the Roger Williams National Memorial for a lively talk on the culture and economy of colonial RI and Roger Williams’ achievements and legacy. The Roger Williams National Memorial on N.Main Street in Providence is one of 5 designated National Parks Service locations in Rhode Island. 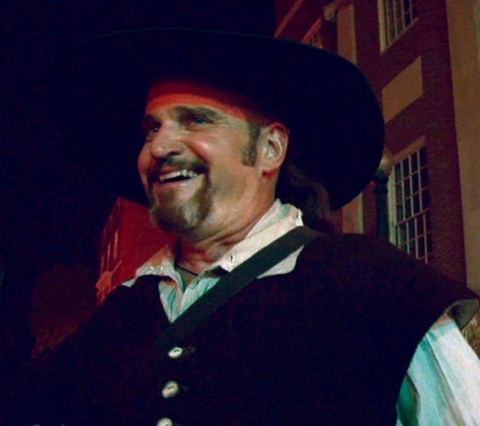 Ray Rickman, will present “How to Talk About Slavery” drawing on knowledge of both Rhode Island and African American history and culture to highlight the effect slavery had – and continues to have – in our state. He will also explain the economic bases of slavery, its African origins, the relation of Rhode Islanders to the slave trade and the economic effects of slavery in the state. 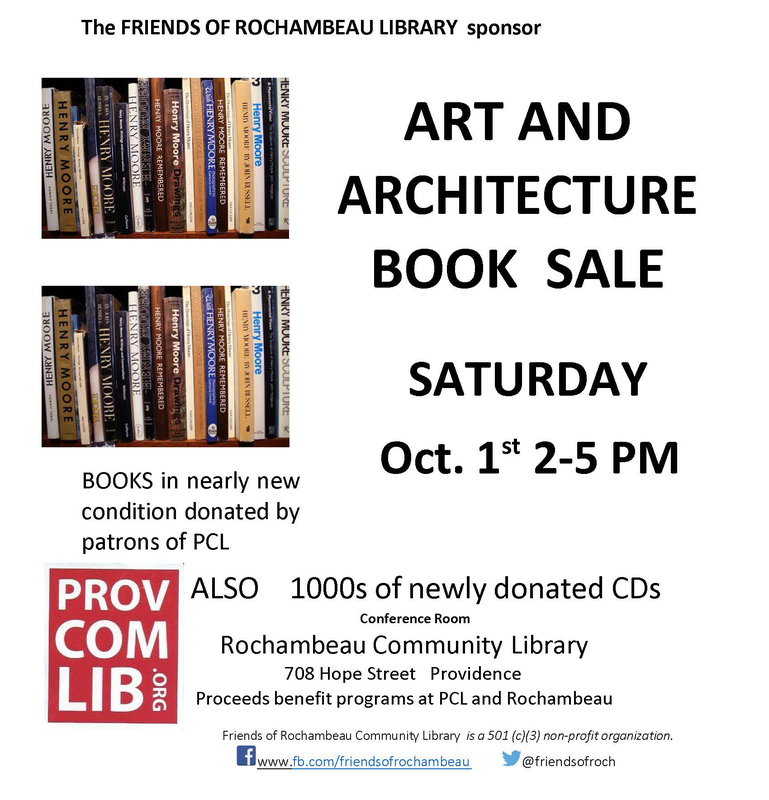 Oct 1st Mini Sale: ART + ARCHITECTURE Book Sale! coffee table worthy books at Rochambeau Library! 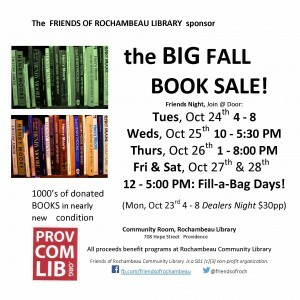 The mini-sale will be in the downstairs conference room, just off the elevator or stairs to the left, at Rochambeau Community Library from 2:00 – 5:00p on the first day of October. We are very proud to offer hundreds of near-new condition books for sale at this event. All books were donated to the Friends by our generous neighbors here in our community! 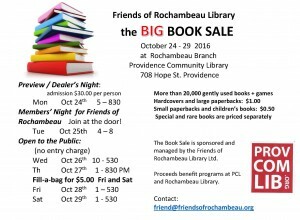 As always, proceeds from your purchases will go directly to support the programs, services and events at your neighborhood location of the Providence Community Library. Bring a friend and tell a neighbor, and we will see you at the book sale! 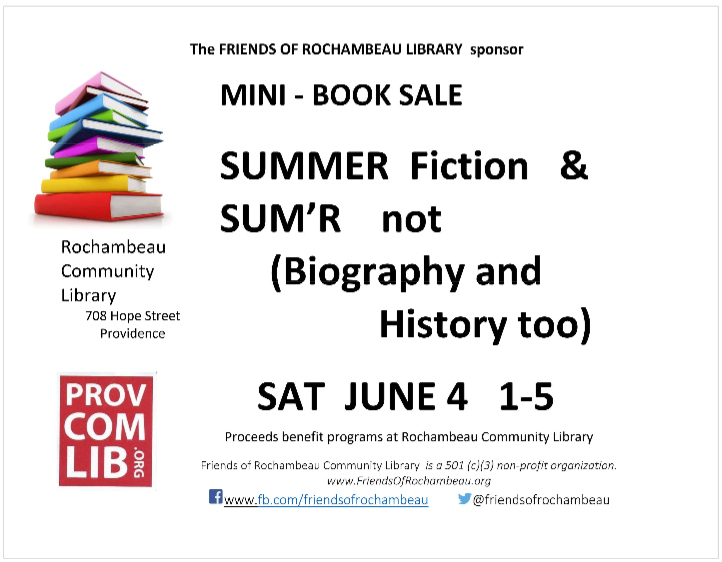 books at the Friends of Rochambeau Library SUMMER FICTION Book Sale! We will be in the downstairs conference room, just off the elevator or stairs to the left, at Rochambeau Community Library from 1:00 – 5:00p on the first Saturday in March. We are very proud to offer hundreds of near-new condition books for sale at this event. All books were donated to the Friends by our generous neighbors here in our community! 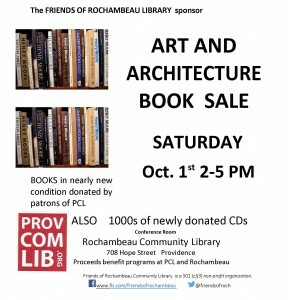 As always, proceeds from your purchases will go directly to support the programs, services and events at your branch location of the Providence Community Library. 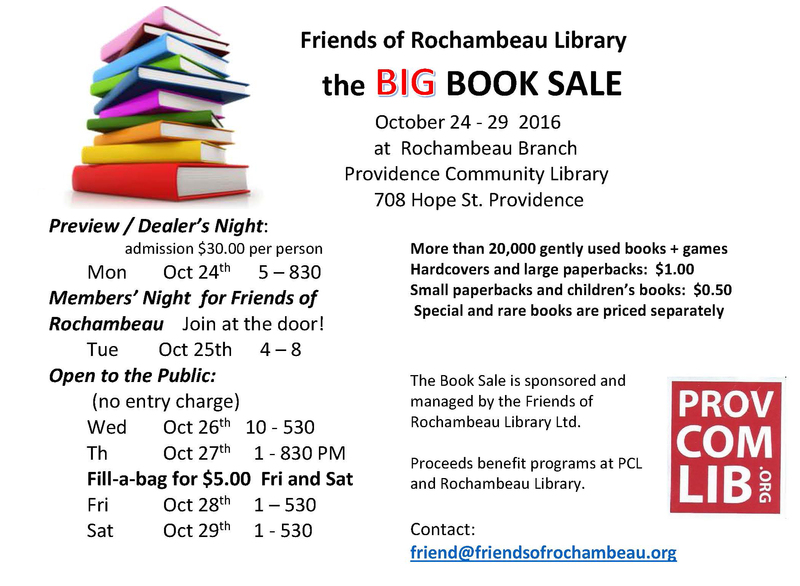 Bring a friend and tell a neighbor, and we will see you at the book sale! 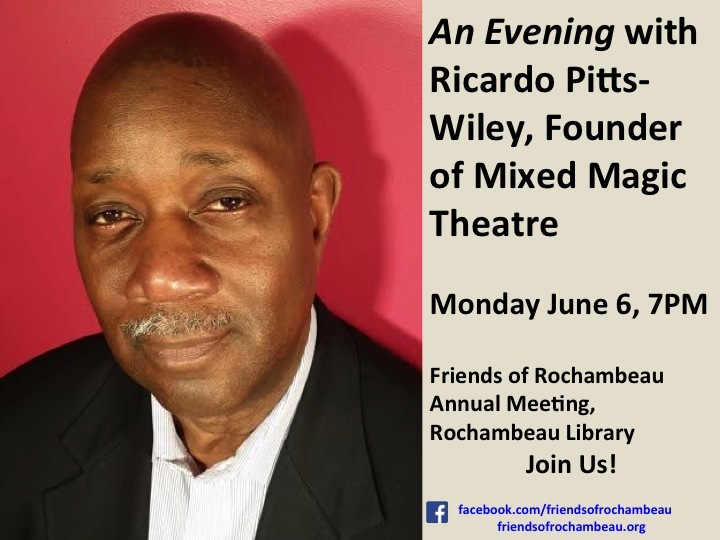 Please join us for our 2016 Annual Meeting, where we will hear from this year’s special guest speaker: Ricardo Pitts-Wiley! Knocking and 35 Miles From Detroit. 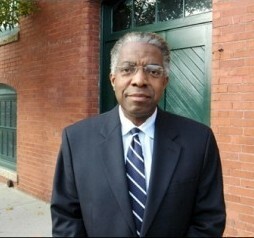 In 2009, Ricardo was the Martin Luther King Visiting Scholar at MIT in Cambridge, MA. 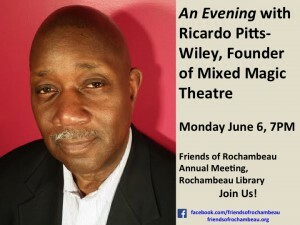 Ricardo Pitts-Wiley is an accomplished actor, director, playwright and composer. He has performed major roles at noted theaters throughout the United States including The Actor’s Shakespeare Project in Boston, Trinity Repertory Company in Providence, RI, The Old Globe Theater and San Diego Repertory in San Diego, North Carolina Black Repertory, Rites and Reason and Perishable Theater.